Well-known for the production of the brewery machines that are easy to use, Keurig offers different types of appliances of this kind. However, people who are not familiar with the specifications of all these types may find themselves staring at the different models without realizing the differences. This is especially true when it comes to comparing Keurig K45 and Keurig K55 that seem to be almost completely identical brewers. 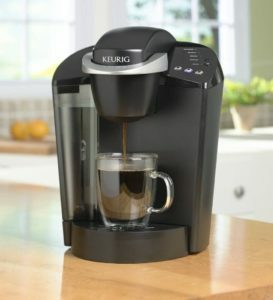 1 What makes Keurig K45 and Keurig K55 so similar? 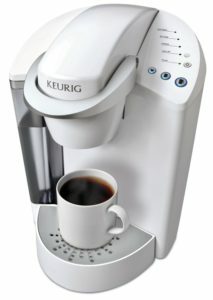 2 What is the main difference between Keurig K55 and Keurig K45? What makes Keurig K45 and Keurig K55 so similar? First of all, you should know that there are numerous features that are the same when it comes o both of these Keurig models. For instance, both K55 and K44 have a water reservoir that can receive up to 48 oz of water and you can choose from three different cup sizes, including 6, 8, and 10 oz. In addition to this, they both have their controls based on one touch button – there is a button for every cup size. Both of these machines come with practical light indicators that make it easier for you to program the brewing process. Removable drip tray is another feature characteristic for both of these appliances, which makes them practical both for the use of larger cups and travel mugs. Apart from the listed similarity, another thing that makes them seem identical is the fact that they both use the older version of K-Cups, that can be reused and refilled, which is an awesome feature for you if you are switching to the use of Keurig K45 or K55 after using another older brewer from this series. What is the main difference between Keurig K55 and Keurig K45? Even though there are no significant technical differences between these brewers, there are two important points that will probably influence your final decision when it comes to choosing the right appliance for you. In the first place, when thoroughly observing these two brewing machines, there is only one technical difference which actually is not vitally important for the quality of the coffee prepared. This change represents the change of tubing and connectors, which doesn’t influence the way the Keurig K55 functions compared to Keurig K45, either. Secondly, the production of Keurig K45 was discontinued in the favor of Keurig K55 and that’s where the main difference between them lies. Keurig K45 is becoming outdated and therefore, investing in buying Keurig K55 is considered as a more rational decision. Keurig K55 is considered as the Amazon Number One bestselling brewer of this kind. The third thing that you may want to know and consider when buying one of these machines, even though it definitely is not the most important aspect, is the additional accessory. If you decide to buy Keurig K45, you will get a free Keurig’s charcoal water filter starter kit. On the other hand, Keurig K55 does not come with this kit and you can only buy it separately, which will cost you about more $$ if you decide to buy it. Finally, the difference that may be the key reason for you to go for one of these machines is the price. If you decide to go for the outdated version of Keurig , you will be able to save some money. The difference in prices is not radical, however, if you are looking forward to buying a brewer on a budget, you should know that you can save $$ if you decide to buy older Keurig model.